There’s no doubt about it that Australia has some pretty amazing scenery. From the gorgeous beaches, to the harsh red center, the landscape of the country is breath taking. But did you know that Australia has a glowing lake? It quite literally does glow, and by all accounts is an eerie sight. Australia really has some spectacular lakes. There is a lake that is pink, and one that glows. Australia’s glowing lake is known as the glowing lake in Gippsland, Victoria. 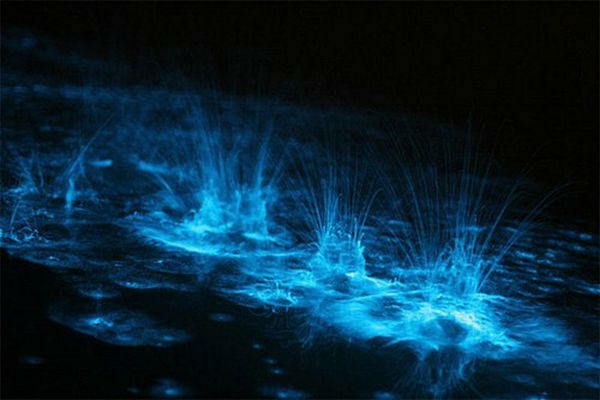 The glowing effect is caused by a microscopic organism called Noctiluca scintillans that have a natural luminescence. How long has Australia’s glowing lake been glowing? This is the thing. The lake hasn’t always glowed, and is a result of several massive environmental impacts in recent years. The series of events that lead up to the lake taking on this glowing attraction began with the fierce fires that ravaged Victoria in the summer of 2006. In total, the fires lasted 69 days and devastated the lakes catchment area. Everyone knew the fires would affect the lakes, but no one knew how much, or even how they would be impacted. In the winter of 2007, seven months after the first fires broke out, the region suffered severe flooding. This flooding washed ash, soil, nitrogen and other organisms into the lakes. Along with these there was also the possibility that farm chemicals were also washed into the lake. The following summer in late 2007 and early 2008 saw the polluted lake develop a blue green algae, also known as synechococcus. This algae is common and extremely toxic. Even touching it can have severe health issues. At the end of 2008 when the new summer period was approaching a new micro organism, Noctiluca scintillans was discovered that fed on the synechococcus. Noctiluca scintillans is naturally bioluminescent and glows a ghostly blue. It glows to attract prey and ward off predators.